Victoria Beckham has set her sights on an exciting new location – but fear not, Beckham family fans – she may not be moving to Miami just yet. 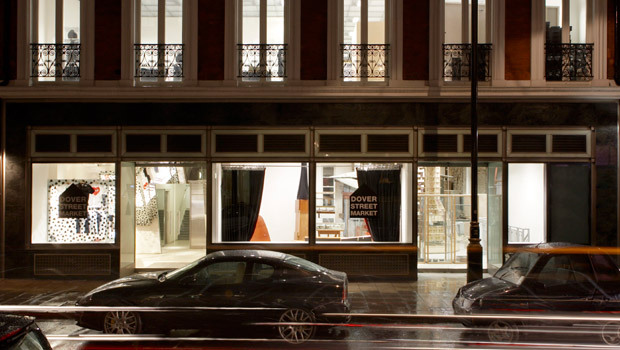 Dover Street Market has long been the hub of the trendiest, cutting-edge flagship stores, but the area could be set to see an injection of some serious glamour with the possibility of Victoria – and a few of her very high-profile British designer friends – moving in. Christopher Kane, Roksanda Ilinic and Victoria Beckham are said to have laid their sites on the Mayfair location for their new boutiques. The area is already home to McQueen’s diffusion line McQ, plus Jimmy Choo, Christian Louboutin and Acne. And now Victoria Beckham is in talks about taking the lease of number 36, according to the Evening Standard. The move is a significant one for Victoria as the store will mark the first bricks and mortar venture on English soil for her namesake label that has gained increasing recognition and accolades. London Fashion Week darling, Ilinic has taken a spot on Mount Street. owned luxury goods brand Kering, has been looking at Bond Street, according to reports, after François-Henri Pinault, CEO of Kering, voiced his desire for Kane to secure a flagship store in London. While initially, many were highly skeptical of Victoria’s abilities to create a credible fashion brand, doubters have been silenced. ‘Impeccable’ was how Natalie Massenet described Victoria Beckham’s AW13 show. Personally, we can’t wait to see what VB’s headquarters might look like!